I don't know if I would put it on my wall, but I think it's completely adorable. super cute is my verdict! Well, it's cute, to be sure. But maybe cute just isn't the decorating statement your roommates are looking to make at this point in their grownup lives! But a whimsical bedroom? Go for it! I think it's adorable but not sure I would put it in my bedroom. Bathroom maybe, though I already have a print of Oswald the Lucky Rabbit in there (he's the precursor to Mickey Mouse). cute! we all need a bit of whimsy in our lives! Oh it's so precious and whimsical. I love it! I love it, but my hubby would hate it because he doesn't like squirrels at all! OH MY WORD- this is one of Cecelia's roommates (who is about 38 months behind the social media times and is now making a first comment on her beloved roommate's blog, thanks to mr. squirrel). Celia mentioned that we should get this print poster size and hang it in the living room....response? ....uhh...errr.... uhhh... 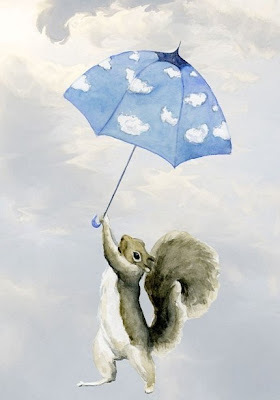 I'd rather just keep one of your chocolate pear ganache cakes in the common space and leave mr. squirrel and cloud umbrella....uhh... somewhere else. BUT this is infinitely better than the creepy doll print currently on your desk....EEEEE...creepy. I have rabid (at least I'm pretty sure they are) squirrels in my neighborhood. I would not choose to put them on my walls, but I can admire it from afar.